The Gospel of Luke 8:16-18 emphasizes that God desires us to respond to His generosity by using our gifts in union with His wisdom and grace. The Lord desires to give us His gifts but He also desires to challenge us. As good stewards of His wisdom, we are not meant to conceal Wisdom’s Light under a “vessel or hide it under a bed.” By virtue of our Baptism, we are all sent out into the vineyard – some early – some late, but called and sent nonetheless, to proclaim the good news of God’s salvation. We need to remember, however, that we will be attacked and maligned when we stand in the vineyard of our existence and promote His love and defend the truth of the Church. Christian discipleship does have a cost. As you read this, Christian martyrs of our own day die in Asia at the hands of the Islamic State, or through the harassment and torture of hostile governments throughout the world. Spiritual martyrdom is also happening in America, at the hands of a secular and hostile media and government that appears to have lost its sense of ethics, Constitutional roots, and tradition. This is exemplified by the recent action of the Oklahoma City Convention Center refusing to hear the arguments of Christians, and Catholics in particular, who are deeply offended and outraged by the planned Satanic mass and exorcism of the Holy Spirit that will occur in a few days. Archbishop Paul S. Coakley of the Archdiocese of Oklahoma City, and his staff, have shown courage and determination in attempting to stop this blasphemy; thankfully, they were at least successful (through the persuasion of a lawsuit) in getting the Satanists to hand over the consecrated host which was to be desecrated in their ceremony. What does the bravery of Archbishop Coakley tell us? It tells us once again that our Church, under pressure and intimidation, refuses to run, refuses to fold, and refuses to hide the Light of Christ’s love, truth, and beauty in a darkened world. Let us pray that the bravery of today’s martyrs who suffer in the public square, or in silence, may inspire us in our ministry of discipleship. The above painting, entitled The Light of the World, was painted by Charles Bosseron Chambers (1882 – 1964). Mr. 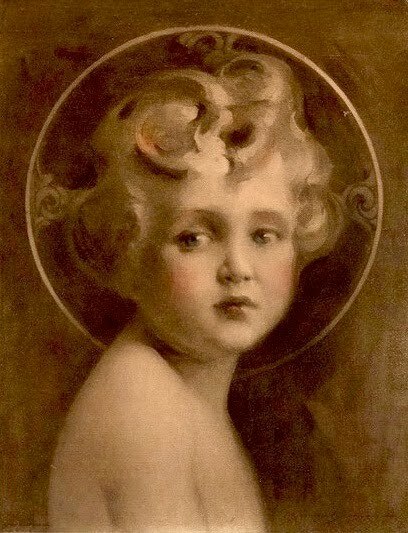 Chambers was born in St. Louis and was known for his figurative work, mainly portraits and works with religious motifs. He studied art at the Berlin Royal Academy and at the Royal Academy in Vienna. In 1916, Chambers returned to America and settled in New York City. It was in New York City that he painted the The Light of the World. This painting by Chambers was the first painting that made an impression on me as a child. My mother hung a framed reproduction of it in the bedroom. I remember staring at it in the dim light that filtered into the room from the hallway and wondering what the child Jesus was thinking. At that time it appeared to me that He had a concerned look in His eye. Why? What was He concerned about? We still have the picture. Now that I am approaching my sixty-seventh year I understand why He is so concerned, but I recognize that it is a concern enveloped in eternal love; a Love that will never be diminished, a Light that will never be withdrawn, no matter what the blasphemies hurled against Him. One of the great blessings the Lord has granted me is the privilege of meeting so many wonderful people who are interested in studying and creating sacred art. An example of this is the fine Rhode Island artist, Lesley Green. Lesley is no stranger to art. She has been interested in it since adolescence and received a BFA from the Rhode Island School of Design. She continued to pursue her studies while taking time out to marry and raise a family. 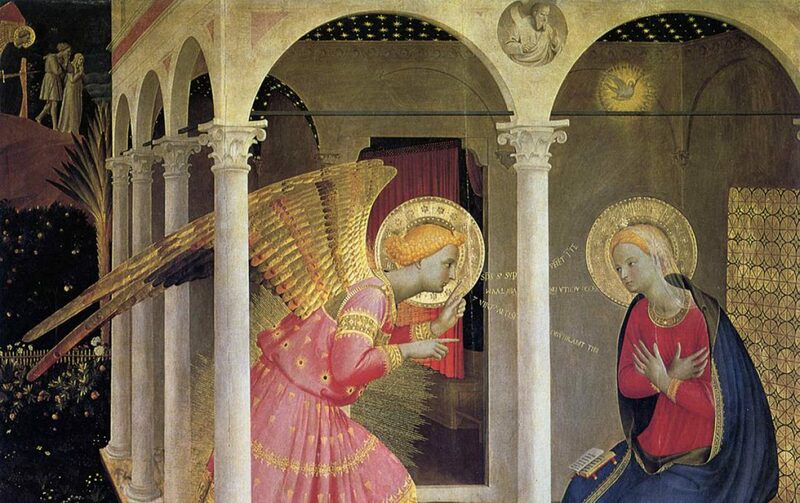 I first met Lesley a number of years ago, when my wife and I started the Fra Angelico Institute for the Sacred Arts. We invited people from around the Diocese of Providence to come to our first informational meeting. I could tell upon first meeting her that she was highly motivated to consider studying and prayerfully create sacred art. I firmly believe that a sacred artist needs to be exposed to, not only a variety of artistic talents and skills, but to the prayerfulness of other iconographers as they practice their ministry in sacred art. As a result, she has since enjoyed studying with Rev. Peter Pearson and Michael Kapeluck, two artists from Pennsylvania who paint in the Russian Orthodox style. “In order to communicate the message entrusted to her by Christ, the Church needs art. Art must make perceptible, and as far as possible attractive, the world of the spirit, of the invisible, of God. It must therefore translate into meaningful terms, which is in itself ineffable. It is this “aura of mystery” that Lesley is prayerfully attempting to make visible to the viewer of her art. For, as sacred artists, we are all called to make visible the “ineffable mystery” that is God, His angels, and His saints. Lesley’s most recent completed icons of Saint Gabriel and St. John the Baptist are quite lovely. I especially like the fact that St. Gabriel is shown holding the Holy Eucharist. As you know, the Archangel Gabriel was depicted in the Hebrew Scriptures as being a healer, especially of the eyes. This sacred icon aptly shows that the source of the Archangel’s power is Christ Himself. The second icon showing St. John the Baptist in a prayerful pose indicates that even in Heaven he continues his mission of imploring us to repent of our sins. St. Gabriel the Archangel and St. John the Baptist, pray for us. In our Gospel last week we stood at the banks of the Jordan River and witnessed Jesus’ baptism by John the Baptist. Today we hear John announce to all that the Spirit of God rests upon Jesus who is described as the Lamb of God and the Light of the World. John goes on to say that Jesus is not an angel, a prophet, nor a magician; rather, He is the incarnate Son of the Most High God. John reminds us that as the “Lamb of God” Jesus has a specific mission. His role is to teach and preach, and most importantly, it is to heal, and that healing can only occur through sacrificial service – specifically through the sacrifice of His own blood. We are just one month past the celebration of the birth of Jesus and today our Gospel reminds us of the purpose of His mission. Five hundred years ago a beautiful painting was completed by the Italian artist Lorenzo Lotto entitled the Nativity of Christ. Lotto presents the typical stable scene, yet, his spiritual insight focuses on one specific artistic touch: he places on the wall behind a kneeling St. Joseph the image of a crucifix with the body of Christ emanating a beautiful glowing light that spills out onto the wood of the cross and the stable itself. To my knowledge, Lotto’s innovation was the first time such an insight had been seen in Western art, but its originality is emphasized by the fact that your eye naturally moves from the crucifix, through the eyes of Joseph and Mary, and then down to the open arms of Jesus. Here as an infant, on the wood of the manger, He freely opened His arms to Mary and Joseph; and as an adult carpenter, He freely laid Himself down upon the wood of the Cross, to be sacrificed in an open embrace of love for all. The challenge of this Gospel is that Christ offers us, as His disciples, the model of sacrificial service. No matter who you are, or what your age or station in life, you can perform sacrificial service to those around you. But it must be offered in the same redemptive spirit that Christ offered His service: with spiritual love and compassion for the souls of those in need. By virtue of our own Baptism we are all called to serve others as Christ has served us. You may be a mother or father caring for children or elderly parents – this care, if offered in the spirit of Christ – is sacrificial service. You may be a sacred artist, laboring quietly and prayerfully to create beautiful images that will assist yourself and others in prayer. This creative labor is sacrificial service. You may be a child or teenager that courageously doesn’t participate in the bullying of another and comforts the one injured – if offered in the spirit of Christ – this is sacrificial service. You may be an adult – sick or aching from the pain of years of courageous work for your family or on behalf of the Church’s needs, such as supporting the pro-life movement or other social and moral justice issues. You see, if in prayer – you offer up your pain and efforts for souls in need – this is Christ-like, redemptive, sacrificial service. So as we offer sacrificial service on behalf of others, we turn our mind to God and place ourselves in His presence. This presence is a moment of prayer for us. Allow me to make a recommendation: when we offer sacrificial service we should say the first verse of Psalm 70, which says, “God come to my assistance, Lord make haste to help me.” By saying this prayer, awareness of our Baptismal discipleship takes root. For it is in that short verse that we successfully unite ourselves to Jesus in the Jordan River, and like Him, receive grace from the Father to continue our mission, even if it ends up on Calvary. As we travel through the dark days of winter, let us not forget that the Light of Christ is always present to us, and that Jesus’ arms will always remain open to patiently help us as we serve others. God come to our assistance. Lord, make haste to help us. ***The above homily will be delivered by me at St. Romuald Chapel at 10 AM, and Noon at St. Francis of Assisi Church, South Kingstown, Rhode Island, USA on Sunday January 19, 2014. Copyright © 2011- 2014 Deacon Paul O. Iacono All Rights Reserved. Notes on the Painting: Lorenzo Lotto’s Nativity of Christ was completed in 1523. It is painted in oil on wood, and is presently in The National Gallery of Art in Washington, D.C.